Thought id post this up incase any of you were thinking of going up! If you are going to attend this one why not put your name down and see who else is coming! REVENGE CRUISE 4 - THE FINAL CHAPTER. THIS IS THE LAST SERIES OF THE REVENGE CRUISES. IF YOU MISSED 1 - 2 OR 3 DO NOT MISS THIS !! 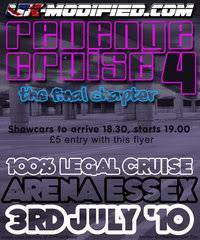 PLEASE SPREAD THE WORD AND MAKE THE LAST REVENGE CRUISE A MASSIVE SUCCESS AS IT HAS BEEN OVER THE LAST 3 CRUISES ! This is on tomorrow night if anyone was thinking of going, thought id remind you!